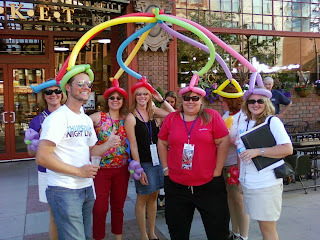 Josh Taylor & his Positively Cleveland girls harnessing their knowledge during Thursday Night Live on West 9th Street. I came home this morning after an appointment and collapsed. I was exhaused! I wanted to post an entry, catch up on some e-mail but kept dozing off. I will NOT admit on this blog that my head actually hit my laptop twice before I gave up and went to sleep. I was supposed to work dayside tomorrow but that’s changed. I’m working mornings and keeping the morning show on the road. The switch to the switch suits me just fine. It also allows me to do a couple of things this week that I wouldn’t get to accomplish working days. Motorola needs to get me my wireless bluetooth headset replacement. I expect its arrival any day and I want it badly for my workouts. I’m been bad this week but I’m going soon to work the stress away. I don’t know how anyone can say there’s nothing to do in Cleveland. Tomorrow night, they’re having a taping of a new beer at Rock Bottom. I’m part of the Mug Club so I get the invite to come for dinner. I think I’m going to do that. By the way, I again want to say how good the food is at Rock Bottom. The service is good too, especially when certain servers are working. Friday, it’s Gavin DeGraw and Marie Digby and Scott Smith. Saturday, I volunteer at my non-profit, I can’t wait. There’s also Luau on the Lake which seems like a good time. I think I get good karma points for helping two non-profits in one day. Moving downtown was one of the best decisions I’ve ever made. You can’t help but get sucked into the life of the city. As I came to my urban home from my parents’ rural home in Wayne County, I thought a lot about the difference living situations I’ve been exposed to over the years. I knew growing up I wanted the experience of living in a place where you could always find excitment. That wasn’t the case in Wayne County. Sure there are things to do but it’s a different approach than city living. On my way home, I talked with my friend, Jeannine, who went from northeast Ohio to live in Los Angeles. Let’s just say we both live in parts of our respective cities that are “up-and-coming” neighborhoods. Read into that what you will. We talked about the things you learn and need to get by when you live downtown. I don’t have a “granny cart” yet to haul my groceries up from my garage to my apartment. Instead, I wrap the plastic bag handles around my fingers and tote them up two flights of steps then grab the elevator up to my floor. There’s a reason God let us discover the wheel. I keep look at the carts at Target but haven’t broken down to buy one yet. Next trip to Target I’m sure I’ll have a “granny cart” in my shopping cart. By the way, Jeannine laughed when I said I didn’t have one yet. She says they are essential to downtown living. Yesterday as you’ll see from the pictures below, I took part with hundreds of other people in RiverSweep 2008. I saw a lot of the Tremont and Ohio City neighborhoods on the way home today and realized how much work all of the volunteers did yesterday. While my area was concentrated to a parking lot. Many people put in a lot of miles on their shoes, you can tell it by all of the trash bags sitting along the road waiting for the city of Cleveland to pick them up. Gone is the trash, what remains is some of the trash bags filled with the litter and a lot of green grass. It just looks clean. I figure if I had a house with a yard, I’d be out Saturday mornings working to keep it clean and since the Superior Viaduct and the riverfront is my backyard, why not put some work in order to spruce it up a bit. I’m interested in getting some mulch and spreading it along underneath the bridge to make it look nicer. Hopefully, that would encourage people not to dump their trash as much. I think all of this downtown living is getting to me. I don’t need to tell you again how pleased I am with the location where I live. It gives you breathtaking views of the Rock & Roll Hall of Fame city even though I can’t see the building itself. You can see the Terminal Tower, Key Tower, the building formerly known as the BP Building, along with the rest of the Cleveland skyline. From a different side, I can see the Main Avenue bridge, the river and the lake. From yet another view, I can see the Veterans Memorial Bridge. I do have one problem, complaint, concern. It’s what you don’t see in the picture from my balcony. It’s somewhat of an eyesore. Under the Superior Viaduct, there’s a bunch of brush and trash. Today, I called Flats Oxbow. One of the things the organization does is to work to promote the Flats by a number of different ways including promoting continued “mixed use” of the Flats. That mixed use includes business and residents. Since I’m now a resident, I contacted them about my “concern”. They gave me the number of Jacobs Investments who owns the Nautica complex. I’m hoping they can clean up all of this brush and trash. If areas look beautiful, people tend to respect them more. You can see a lot of trash right now along Elm Street. There is a lot of beautification that could go on right now. I want to be part of that effort. I’m going to take a little initiative and clean up some of the trash myself. A green St. Patrick’s Day jacket has been sitting out next to a tree out my window since mid-March. Several pieces of construction material also has lined Elm Street since before the snow hit. It’s not on Nautica property so it’s fair game for a little clean-up. So what’s part of the solution? Coming up in May, Flats Oxbow is participating in RiverSweep. I’m in the process of getting more information and the people at Flats Oxbow are working to get a group of people together to canvas this area. 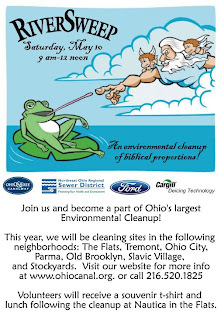 I’m going to spend three hours of my day that morning to help make Cleveland, Cleanland. Anyone else got three hours they can donate? There is live music and food served after the clean-up! I do but actually I’m feeling the most refreshed I have at this time of the morning all week long. I don’t know what that adds up to being. I could figure it out but I don’t wanna. I just know it’s the most I got all week. I’m not as cranky and even got accused of being energetic, not perky as my co-worker, James, called himself. Let’s now look forward to the weekend. This week has been particularly long for me. I know it’s the schedule but I truly wished Wednesday was Friday. I plan to take it easy and relax a little. My place has suffered a little in the cleaning department. Anyone know a good maid? By the way, I no longer resemble Shaggy. I put more money into Cleveland with my first ever haircut downtown. I hate the fact I’m not going to my normal barber out in North Olmsted but by the time you figure in gas and time costs, it’s just as cheap to go get my hair snipped minutes away from my apartment. Or should it be opening soon?? A new multi-purpose business is opening in my building. I don’t have the exact names of all of the places but it’s a martini bar, coffeehouse, and a convenience store. I just toured the place moments ago and met the owner, Twyla. She’s done a great job of putting together a business that should cater to people living on the west bank of the Flats. Those of you who know me know I don’t drink caffeine so the coffeehouse, Mocha (I think) is off limits. There’s a breakfast bar and a pizza oven that’s accessible through the mouth of a giant mask (New Orleans style) artwork on the wall. The martini bar has fiber optic lights in it that light up at night. Twyla tells me she drilled all of the holes in the bar herself before installing the optics. 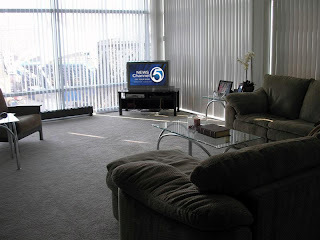 The furnishings throughout the place are modern just like the structure of the building remodel. However, the building was once the home of Cantina del Rio when the west bank was still hopping. Things have changed since then, T.G.I.Fridays has closed down. Shooters, Christies, Howl at the Moon are still here anchoring the west bank. I can’t forget about the Flat Iron, which technically is on the east bank. It’s still a good place to eat. There’s also McCarthy’s and the Harbor Inn which have both been around for years. So this is growth, Cleveland. 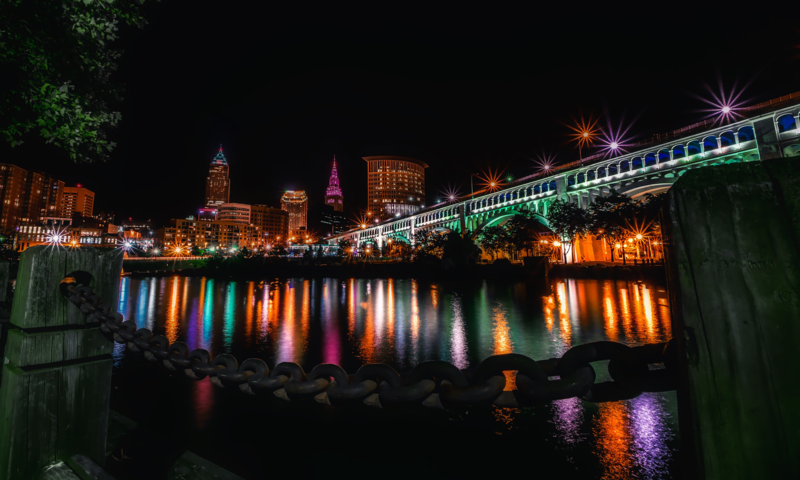 Get behind it and relish what someone who is a native Clevelander who’s come back to her hometown and is giving back to her city with the opening of a new business that offers far more than food, drinks and coffee. There are groceries, concierge, services, even lottery tickets. Oh, Twyla promises me they will have 1% milk. That’s a must for me. Last March on my blog, I entered a very simple post on my blog called “Downtown Living” and my message was “Ain’t it great!”. I took a picture from my friend, Luke’s apartment. Now, I do know it IS great. Just a glance up, you couldn’t help but see an RTA running by just above the Plain Dealer Pavilion. Seconds later, I heard a barge navigating down the Cuyahoga River. These are the sights and the sounds of the city. You know it’s alive and breathing, even on a Saturday morning in chilly January. Now, there’s a SYSCO truck backing up with the beeping warning signal, ready to unload all of the restocking of food for the restaurant. No matter when or where you look you’ll always see a seagull flying around in the air. There’s really no lack of visuals out the windows. It’s a great reminder knowing the world continues every second.